On this page we present a collection of articles, photos and videos highlighting the activities and successes of the Vison2020 platform. Vision2020 is an innovation platform for research organisations and companies participating in the 'Horizon 2020' EU funding programme. Vision2020 acts as a hub to connect Horizon 2020 participants from excellent research organisations and innovative companies, and works to maximise the value and funding its members can obtain. London, UK - April 19, 2018 - Vision2020, a European network consisting of over 300 SMEs, universities, research organisations and big businesses, will exhibit at the Hannover Fair in Germany from April 23 to 27. The Hannover Fair is considered to be the largest industry exhibition in the world. As part of their mission to facilitate collaboration between academia and industry in support of open research and innovation in Europe, London based Vision2020 will be in Hannover to support OPENiSM, a European project and research platform designed to help SMEs innovate by connecting them with appropriate expertise, focused on addressing their specific, innovation challenges. Through OPENiSME, Vision2020 and their project partners will have a booth at the Hannover Fair to present themselves and the companies that have benefited from using this platform. Having launched in 2015, the OPENiSME project will end in May 2018. During that time, Vision2020 has been actively engaged in OPENiSME by promoting its benefits through their own network channels and enabling appropriate SME candidates to access and generate success through the platform. OPENiSME is a project co-funded by the European Union's CIP Program (Grant Agreement No. 621121), designed to help develop the innovative capacity of small businesses aspiring to grow through the facilitation of new partnerships. The project is coordinated by T2I (Transferimento Tecnologico e Innovazione) and supported by 7 other partners: Idexlab (France), V2020 Network (United Kingdom), Jozef Stefan Institute (Slovenia), Hochschule Fulda (Germany), TAGES (Turkey), AKEP (Greece), Laval Mayenne Technopole (France). Vision2020 held a Horizon 2020 Manufacturing 4.0 Event on 26-27 September 2016 at the University of Navarra, San Sebastian, Spain. This free collaboration event was hosted by CEIT-I4K, LEITAT, Fraunhofer IWU, EEN and the Basque regional government, and focused on opportunities in manufacturing, materials, and digital manufacturing under Horizon 2020. Day 1 of the event was open to Vision2020 members only, but Day 2 of the event (shown above) was public, with over 150 delegates in attendance and a matchmaking platform (B2Match) in operation that facilitated over 300 face to face meetings. Wanted: The Human City. As cities grow, we keep adding technology: we’re sensing, filming, measuring, analysing and controlling our urban environments constantly. The first ERC=Science² project campaign spotlights numerous European Research Council-funded researchers who are studying everything from how software is affecting city management, nature builds ecosystems in a diminishing number of green spaces, coastlines are failing to protect us from tsunamis, new ways of modelling cities, and how, in addition to being a source of annoyance, traffic noise actually damages our health. In this article International Innovation spotlights Health Tech 2020, a networking and matchmaking event hosted by Vision2020 in response to the near €2 billion of health and ICT innovation-based funding pledged by the European Commission. With support from the Mayor’s Office of London, the event was held at City Hall in London on 29-30 October 2015 and organised by Vision2020: The Horizon Network members, including Imperial College London, King’s College London, University College London (UCL), KU Leuven and MedCity. In April 2014 Vision2020 held its third Small and Medium Sized Enterprise (SME) information event in Barcelona, hosted by LEITAT Technological Centre. In this video Sr Eusebi Cima, President of LEITAT, welcomes delegates and provides an overview of the centre's activities and its involvement in the Vision2020 initiative. The overall theme of the event was connecting SMEs with research and technology organisations in order to win funding from the Horizon 2020 European funding programme. With the expertise of our friends at Research Media we've developed the following animation explaining the Vision2020 network and the Crowdhelix collaboration platform. On 29th April 2016 Vision2020's Health Helix set out its position on the current state of therapeutic innovation across the EU in a position paper. Partnerships between research intensive small and medium sized companies could lead to excellent opportunities to shape early therapeutic innovations, and strengthen competitiveness in this area across the EU. The Spanish news channel RTVE reported on our first Vision2020 Climate Helix event in Castellón, Spain, on 9th and 10th November 2015, kindly hosted by Institute for Ceramic Technology (ICT). The aim of the event was to share best practice and discuss forthcoming Horizon 2020 Climate and Environment calls in order to identify common areas of interest and further collaboration opportunities between Vision2020 members. On 27th October 2015 NHS Confederation’s European Office co-organised a UK info day with Academic Health Science Networks, the Knowledge Transfer Network and the Medical Research Council in Leeds, aimed at increasing and encouraging collaboration nationally and internationally on health research and innovation. In this video from the day, Vision2020's Director, Abdul Rahim, outlines the Vision2020 platform and its work in support of Horizon 2020 innovation activities. 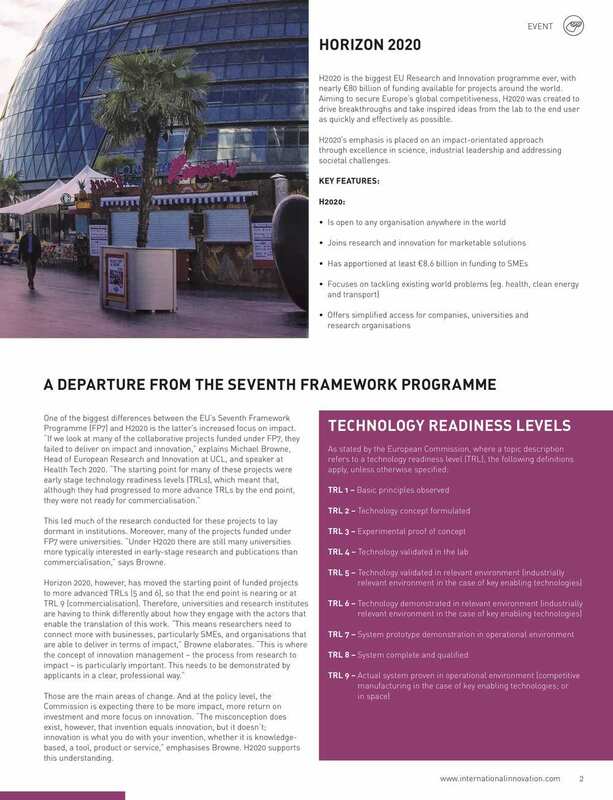 In April 2015, International Innovation published an article on the Vision2020 platform as part of the second chapter of their "UK Innovation Hub" series. This article features an interview with Vision2020's Director, Abdul Rahim, and three case studies highlighting how the platform has driven productive collaborations under the Horizon 2020 programme.